An inmate facing a death sentence for killing a 14-year-old girl was stabbed to death while in the recreation yard of the San Quentin State Prison. 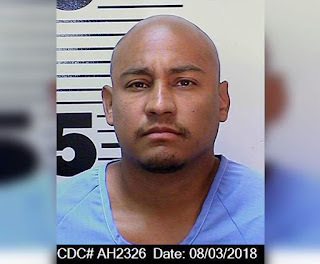 Jonathan Fajardo, 30, who was on death row for first-degree-murder in connection with the racially charged shooting death of Cheryl Green in Los Angeles, was stabbed in his chest and neck in the East Block Housing Unit recreation yard of the prison just before 10 a.m., according to the California Department of Corrections and Rehabilitation. Luis Rodriguez, 34, was identified by prison officials as the suspect in Fajardo’s fatal stabbing. Officials said Rodriguez, who was also on death row, made the weapon used in the attack. Officials did not immediately release a potential motive in the stabbing. Prison officials said Rodriguez had been facing a death sentence on two counts of first-degree murder with special circumstances at the time of the Friday’s attack. He started his sentence on September 30, 2015.